The beach has so many things going against it like sand in your shoes, hardly any shade and it's either too hot or too cold... so why as a photographer do I love shooting there and encourage my couples to take advantage if there's one nearby? Because there's a romantic playfulness in our minds when we think about the beach, and when we finally get there our inner child blossoms and... everyone smiles! Girls in high heels are forced to kicked them off and there is always one person who HAS to put their feet in the water, no matter what the calendar says. And from my point of view the beach offers probably the easiest clean slate of a backdrop to deal with, even if it's the hottest day in August the photos can look like we had a vast empty space all to ourselves. The wedding photos I'm sharing with you today are from a beautiful day I spent with Andrew and Anna back in April. 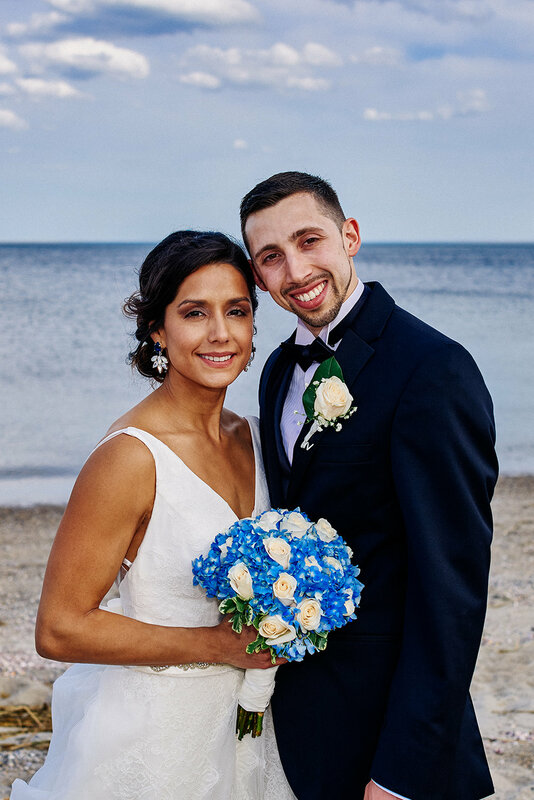 Their Catholic ceremony was held the stunning St. Pius X in Fairfield, CT. After sharing their love for each other with their closest friends and family, the couple and their 8 bridesmaids and 8 groomsmen piled into limo that took them on the short drive to Fairfield Beach. Though it was the middle of the day, Spring offers such stunning light and we were able to take advantage of all the sun had to offer. Organizing a group of 10 excited people who are ready to party can be tough! But we managed to take some wonderful group shots, some serious and some silly. My personal favorite moments are those times when everyone breaks from their fake smile and starts laughing uncontrollably. It's contagious and I love how each person's true personality shines through. My favorite photos from our visit to the beach were the ones that showed off Anna's gorgeous gown, the back of which was especially elegant. The open back that framed her shoulders beautifully draw to a point at another lovely detail I am obsessed with, the bow. It hits her in the most perfect place and flows into the skirt that is decorated with lace. 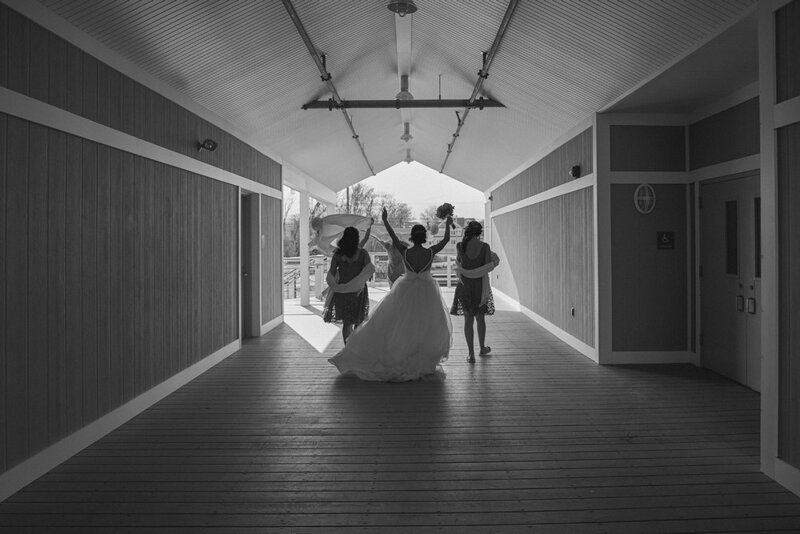 At the end of our trip to the Connecticut beach, the bride and bridesmaids walked through the structure with their scarves blowing above them in the wind. It was a fun candid moment that I am glad I was there to capture. The girls were wonderfully backlit which lended the photo to be presented in black and white. 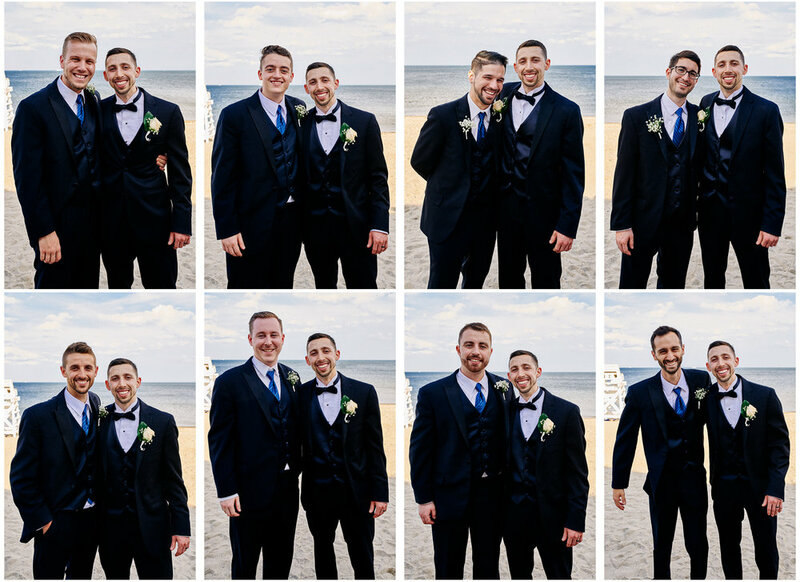 I truly hope you can use the images in this blog post as inspiration for your own beach or near-the-beach wedding. I hope I inspire you to use the best of the world around you to create these lasting memories in photographs on your most special day.